More information about the board can be found at the Arduino Due website. The Atmel SAM3X8E Datasheet has the information and the datasheet about the processor. This configuration is not supported by Arduino. Other hardware features are not currently supported by the Zephyr kernel. 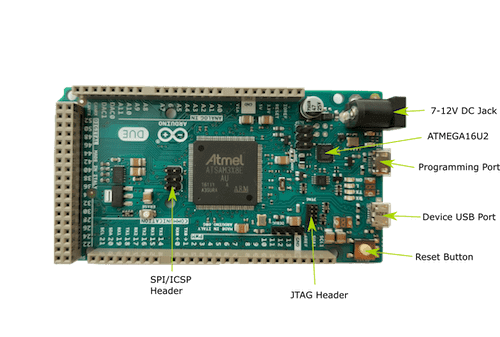 See Arduino Due website and Atmel SAM3X8E Datasheet for a complete list of Arduino Due board hardware features. The default configuration can be found in the Kconfig boards/arm/arduino_due/arduino_due_defconfig. For I2C, pull-up resistors are required for using SCL1 and SDA1 (near IO13). There are 15 fixed exceptions including exceptions 12 (debug monitor) and 15 (SYSTICK) that behave more as interrupts than exceptions. In addition, there can be a variable number of IRQs. Exceptions 7-10 and 13 are reserved. They don’t need handlers. A Cortex-M3/4-based board uses vectored exceptions. This means each exception calls a handler directly from the vector table. Handlers are provided for exceptions 1-6, 11-12, and 14-15. The table here identifies the handlers used for each exception. After a reset, all exceptions have a priority of 0. Interrupts cannot run at priority 0 for the interrupt locking mechanism and exception handling to function properly. Arduino Due has two external oscillators/resonators. The slow clock is 32.768 kHz, and the main clock is 12 MHz. The processor can set up PLL to drive the master clock, which can be set as high as 84 MHz. The Atmel SAM3X8E processor has a single UART that is used by the SAM-BA bootloader. This UART has only two wires for RX/TX and does not have flow control (CTS/RTS) or FIFO. The RX/TX pins are connected to the ATmega16U2, which provides USB-to-TTL serial function. The Zephyr console output, by default, is utilizing this controller. Flashing the Zephyr kernel onto Arduino Due requires the bossa tool. There are GUI and command line versions of the bossa tool. The following section provides the steps to build the command line version. Please refer to the bossa tool’s README file on how to build the GUI version. Checkout the bossa tool’s code from the repository. Checkout the arduino branch. The code on the master branch does not work with Arduino Due. Build the command line version of the bossa tool. The resulting binary is available at bin/bossac. Applications for the arduino_due board configuration can be built and flashed in the usual way (see Build an Application and Run an Application for more details). Here is an example for the Hello World application. After building the application, press the Reset button before running the flash command, so the board will boot into the SAM-BA bootloader and be prepared to receive the new program. The -o option tells minicom not to send the modem initialization string. Now press the Reset button and you should see “Hello World!” in your terminal.